The debt level for American’s is completely unsustainable. Most of the people need to use credit or they wouldn’t be able to survive. 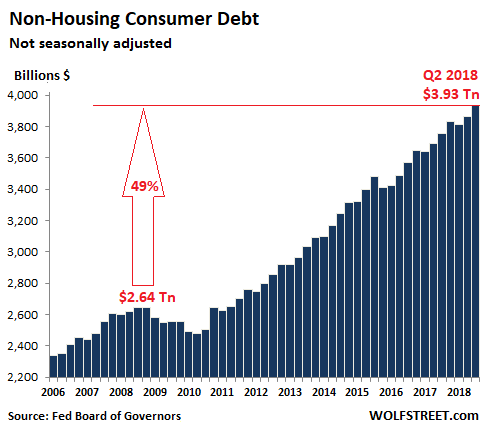 The amount of personal debt has increased dramatically. American’s have been resorting to payday loans to make ends meet. DR Horton reports that housing sales are declining because of the rising rates and skyrocketing housing prices. 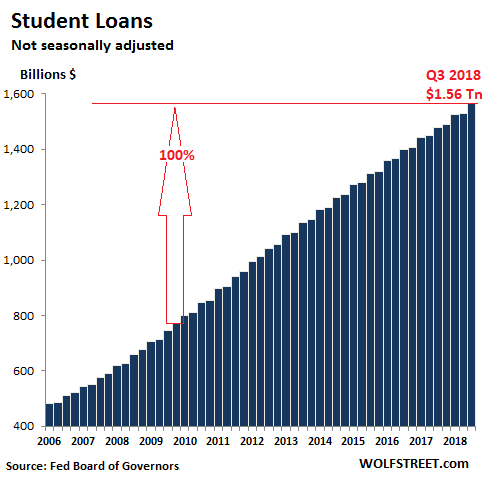 Peter Schiff says this economy has never recovered, the jobs numbers has been inflated by using debt and when everything falls apart it will be a disaster. The Fed is continuing its course, and will continue to raise rates, we are getting closer to the finale. White House suspends CNN reporter Jim Acosta press Credentials. Trump might change the asylum rules with an EO. Facebook ignores call to appear in front of Canadian and UK lawmakers. UAE will reopen its Embassy in Damascus, other middle eastern countries will follow. Q drops more bread, ]Sessions[ was activated, it was not what we thought. Red October was on Nov 7. Q explains that the President is getting ready to declassify certain information and we might see protests, riots and much more. Remember Q said people will reject, fight against it etc.. Be prepared, conspiracy no more, it’s time. 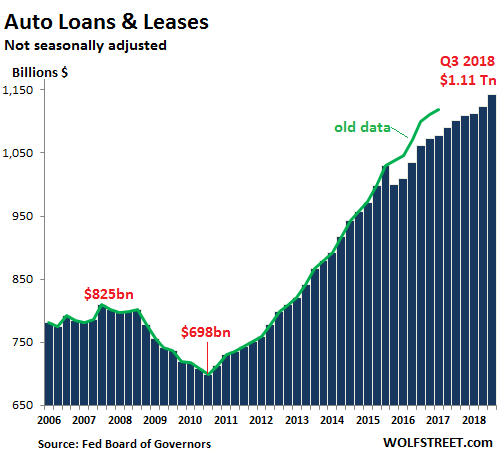 Auto loans and leases for new and used vehicles in Q3 jumped by $41 billion from a year ago, or by 3.7%, to a record of $1.11 trillion. These loan balances are impacted mainly by these factors: prices of vehicles, mix of new and used, number of vehicles financed, the average loan-to-value ratio, and duration of loans originated in prior years. Americans take out roughly $50 billion in payday loans a year, each racking up hundreds of dollars in fees and interest. Payday lenders say they provide a necessary service, with many Americans unable to come up with cash to cover an unexpected financial emergency. They also say they lend to the country’s most desperate, who are often the highest risk for not paying back the loan. D.R. Horton Inc (DHI.N), the largest U.S. homebuilder, said on Thursday rising home prices and higher mortgage rates were weighing on demand, particularly for expensive homes. Schiff says “the truth is we don’t have a booming economy,” and he’s not the only one who has noticed. Schiff says that jobs are just one more bubble that’s about to burst. While Trump has called the Fed’s rate hikes his “biggest threat,” Powell, who was Trump’s hand-picked choice to lead the Fed, has avoided responding directly to the criticism. the White House has finally suspended the “hard pass” press credential for CNN narrative engineer Jim Acosta following his rude behavior and physical confrontation with a White House intern earlier today. The directive under consideration requires asylum seekers to make their claims at a port of entry along the border, Those who cross illegally and turn themselves into border agents will be deemed ineligible for asylum. Under current law, a migrant can request asylum if he is in U.S. territory, regardless of how he got there. If the asylum seeker is found to have a “credible fear” of persecution in his home country, he is permitted to remain in the U.S. as he waits for his case to play out in immigration court, a process that can take months or years. No they say there are long lines at the ports of entry by admitting just a handful of asylum seekers each day. United Arab Emirates is preparing to re-open its embassy in Damascus after six years of closure, which is to kickstart a new regional shift. This comes as Gulf Cooperation Council (GCC) countries are reportedly strongly considering the restoration of diplomatic ties with the Assad government after all GCC states had closed their Syrian embassies in 2012. The significance of this is huge, coming after seven years of war driven by an official policy of Syrian regime change by these very GCC governments, foremost among them Saudi Arabia, the UAE, and Qatar. Thank You Trey Gowdy and Bob Goodlatte! Some have noted the letter of resignation is undated. it was written prior to the official request from the office of the president. Once requested it was delivered. When Q said activate sessions , did activating him mean going after these individuals or did it mean that he was activated to step down. Sessions has passed the ball to the acting AG, along with everything he’s been working with Huber on. Deputy Attorney General Rod Rosenstein headed to the White House Wednesday afternoon after Jeff Sessions was resigned. Fun Fact…today is the Anniversary of Red October in 1917!! The revolution was led by the Bolsheviks, who used their influence in the Petrograd Soviet to organize the armed forces. Bolshevik Red Guards forces under the Military Revolutionary Committee began the occupation of government buildings on 7 November 1917 (New Style). Acting AG Whitaker to Release All “Blocked” Documents Requested by House? four senior members – House Judiciary Committee Ranking Member Jerrold Nadler (D-NY), Intelligence Committee Ranking Member Adam Schiff (D-CA), Oversight and Government Reform Committee Ranking Member Elijah Cummings (D-MD), and Senate Judiciary Committee Ranking Member Dianne Feinstein – sent letters to top Administration officials demanding the preservation of all documents and materials relevant to the work of the Office of the Special Counsel or the firing of Attorney General Jeff Sessions. “Committees of the United States Congress are conducting investigations parallel to those of the Special Counsel’s office, and preservation of records is critical to ensure that we are able to do our work without interference or delay. The letters were sent to numerous Trump administration officials including the White House Counsel Pat Cipollone, FBI Director Chris Wray, Director of National Intelligence Dan Coats, CIA Director Gina Haspel, Deputy U.S. Attorney for the Southern District of New York Robert Khuzami, Treasury Secretary Steven Mnuchin, NSA Director Paul Nakasone, IRS Commissioner Charles Rettig, and Acting Attorney General Matt Whitaker. Almost immediately following Sessions’ resignation, we started to hear about pro mueller rallies that are being organized around the nation, more on this in just a couple of minutes. Martial law can be used by governments to enforce their rule over the public. Such incidents may occur after a coup d’état (Thailand in 2006 and 2014, and Egypt in 2013); when threatened by popular protest (China, Tiananmen Square protests of 1989, 2009’s Iranian Green Movement that led to the takeover by Revolutionary Guards); to suppress political opposition (Poland in 1981); or to stabilize insurrections or perceived insurrections (Canada, The October Crisis of 1970). Martial law may be declared in cases of major natural disasters; however, most countries use a different legal construct, such as a state of emergency. The act only specifically applies to the United States Army and, as amended in 1956, the United States Air Force. While the act does not explicitly mention the United States Navy and the United States Marine Corps, the Department of the Navy has prescribed regulations that are generally construed to give the act force with respect to those services as well. The act does not apply to the Army National Guard or the Air National Guard under state authority from acting in a law enforcement capacity within its home state or in an adjacent state if invited by that state’s governor. The United States Coast Guard, which operates under the Department of Homeland Security, is not covered by the Posse Comitatus Act either, primarily because although the Coast Guard is an armed service, it also has both a maritime law enforcement mission and a federal regulatory agency mission. I almost hope they don’t ask. It would be fun to watch them try to manage the spin when 90% of the country is aware of you and all that you’ve been shining a light on, while the MSM still can acknowledge it. I can see them squirming now..
Trump said Wednesday that he is “seriously” considering declassifying a slew of documents requested by former Republican House leaders investigating the FBI’s handling of the Russia probe. The president warned that he was still “seriously” considering declassifying the documents that the Republican Congress has been demanding for the past year. Lawmakers have sighted a need for transparency in the bureau’s handling of the FBI investigation into the Trump campaign. The documents include all documents related to DOJ official Bruce Ohr’s interviews with the FBI. Ohr, who has been demoted three times for not informing his superiors of his role in the FBI investigation, gave a deposition to Congress in August where he admitted he was used as a back channel by the FBI, so the bureau could continue to communicate with former British spy and dossier creator Christopher Steele. At the time, the FBI had terminated Steele as a confidential source when it caught him giving communicating with the media. It will be enacted to handle the impending riots. by the end of the day major leftist organizations had already put together protests in 900 U.S. cities to make a “public demand for action to correct this injustice”. One protestor can be seen ringing the doorbell outside Carlson’s residence, while the rest of the group chanted anti-Carlson slogans. The co-founder of Smash Racism DC, fired college professor Michael Isaacson, made headlines last year after tweeting about teaching “future dead cops” and assassinating both President Trump and VP Mike Pence the day before they won the 2016 election. Isaacson describes himself as a “pansexual” activist not limited to a gender or sexuality. Anon explains… Borders are sealed, judges are seated. Senate is in the control of patriots. Executive orders, laws and rulings are in place. The research and indictments on all their crimes are all on the books waiting to be unsealed. Knowing that knowledge of Mueller’s activities was the left’s red line, that they would riot and spill blood once it was crossed, Sessions gave Trump allies time to prepare and arrange all of the things, Sessions was in place to keep the deep state busy on Trump while everything was prepared behind the scene. The deep state/MSM was focused on Sessions, trusting him, so everytime Q said Trust Sessions, it was about the deep state trusting him.. Now he stepped aside to eliminate the recusal and a new AG has already been prepared for action, everything is in place. The deep state was already ready and prepared for this day, websites were ready to push protests/riots, Trump and his admin prepared by enacting martial law if needed. Borders will be shut down and arrests will be made. But none of this will stop the Declassification, the world will know. The storm of pain is upon us.